A few years ago, while Chattanooga, Tenn., made headlines for revitalizing its downtown, residents, mostly African-Americans, living just a few miles away in the Glass Farms neighborhood, were struggling to cope with years of disinvestment and decline. Storefronts were empty, buildings abandoned. Crime was through the roof. A tiny, local nonprofit, Glass House Collective, then formed, enlisting neighbors and designers. Public workshops were held. Low-cost plans were devised for new sidewalks, bus shelters, streetlights and green spaces along the neighborhood’s main drag, Glass Street. 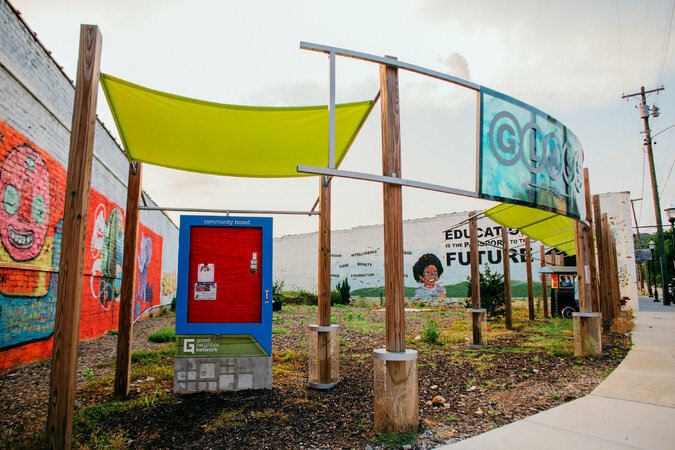 A vacant lot became a pop-up community center. Artisans moved in to train young residents to make furniture and other things. The steps were small, tactical, targeted. Crime fell. 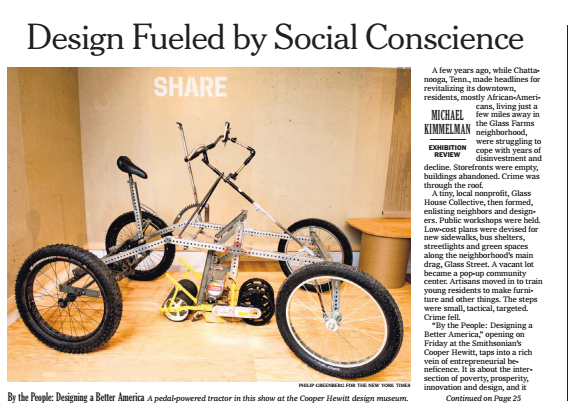 “By the People: Designing a Better America,” opening on Friday at the Smithsonian’s Cooper Hewitt, taps into a rich vein of entrepreneurial beneficence. It is about the intersection of poverty, prosperity, innovation and design, and it couldn’t be timelier. If stories like the one from Chattanooga unavoidably turn out to be more complicated than any museum display can make clear, the spotlight is at least pointed in the right direction. 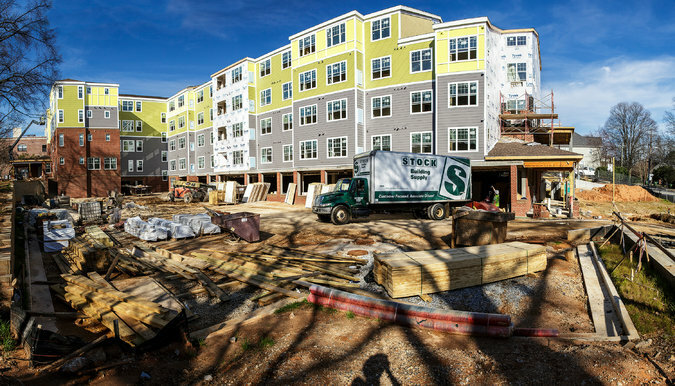 Reynoldstown Senior Housing, a project under construction near the Atlanta BeltLine, features 70 units of affordable housing. CreditAtlanta BeltLine Inc.
As the show’s title implies, design is not just the task of designers. 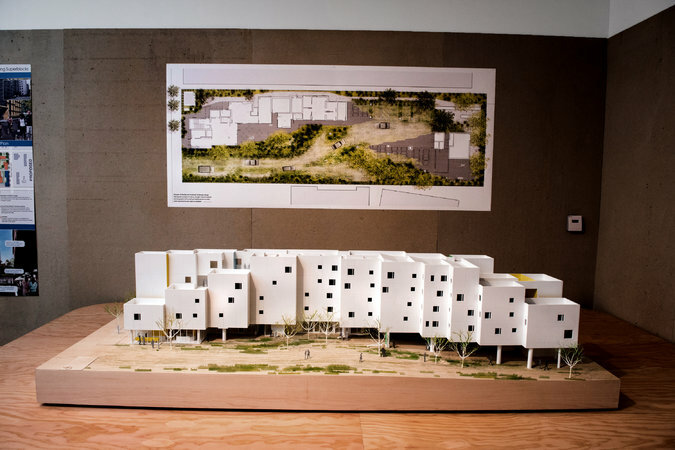 The exhibition celebrates a few outstanding architects, like David Baker andMichael Maltzan, who have conceived subsidized housing in California, and also Jeanne Gang, the Chicago star, who wants to improve relations between the community and law enforcement by reimagining police stations as neighborhood hubs, with gardens and gyms, meeting rooms and free Wi-Fi. Mostly, though, the show is about ideas collectively developed or bubbling up from the bottom. 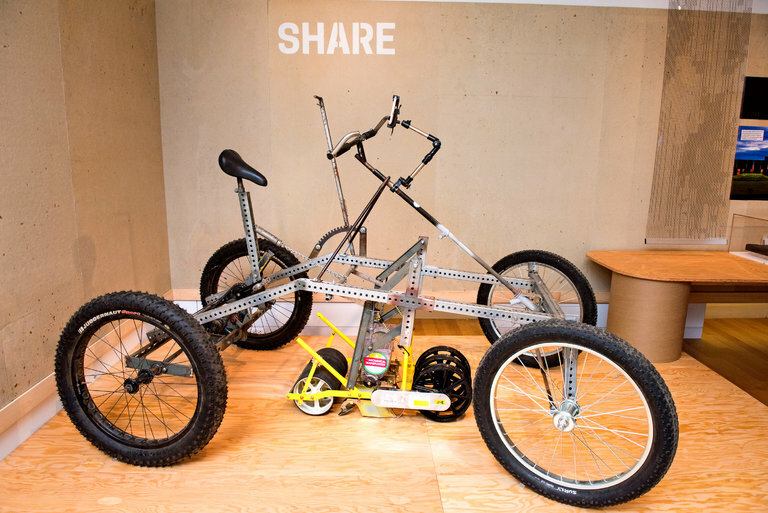 What results can take numerous forms: a plan to shrink Detroit; a pedal-powered tractor; an ironic board game explaining the housing market; a jewelry business employing formerly homeless women to make items using chipped-off graffiti; an online tool for mapping commute times; labels on baby products with child-rearing tips. In other words, “By the People” is about just what it says, everyday citizens cooking up solutions to what ails their communities. That tractor evolved from crowd-sourced tinkering on an open platform called Farm Hack, a grass-roots website developed by family-farming Davids competing with industrial agriculture’s Goliaths, sharing strategies about how to grow healthy food and build tools and machinery, economically. The system is imperfect, but then, so is democracy. Cynthia E. Smith is the Cooper Hewitt’s curator of socially responsible design. She spent years traveling the country, logging 50,000 miles, looking for examples of people “designing a better America.” In 2007, Ms. Smith presented “Design for the Other 90 Percent,” a compilation of 34 inexpensive, lifesaving objects, including a filtered drinking straw to stem the spread of cholera; and the Q Drum, a kind of tire, holding up to 13 gallons of water, which could be rolled long distances even by children. Big things grown from small seeds. That event led four years later to a show focused on cities. Ms. Smith highlighted floating schools in flood-prone Bangladesh; a kind of do-it-yourself irrigation system in Dakar, Senegal; a new management and community-development plan for slums in Bangkok; and the story ofDiadema, an industrial city outside São Paulo, where informal settlement and homicide were the norms. Officials in Diadema enlisted residents to help formalize and design their neighborhoods. Deaths plummeted. That’s simple to say and not always enough, but it remains a good operating principle and the abiding motif in “By the People,” which offers its own mash-up of do-good projects, 60 in all. One could probably think, offhand, of 60 deserving alternatives for what’s in the end a contestable, albeit noble, sampling. By their nature, these sorts of shows are tonics and provocations, suggestive rather than definitive, shy on eye candy, requiring comfortable shoes and lots of squinting at wall texts. In return, there’s a gee-whiz quotient — so many people, so many good, simple, can-do ideas. So much hope. I was struck by a project like Fresh Moves. Across the country, obesity and diabetes have become epidemic in food deserts, meaning low-income neighborhoods without easy access to fresh fruits and vegetables, where fast food is often the cheapest or only option. 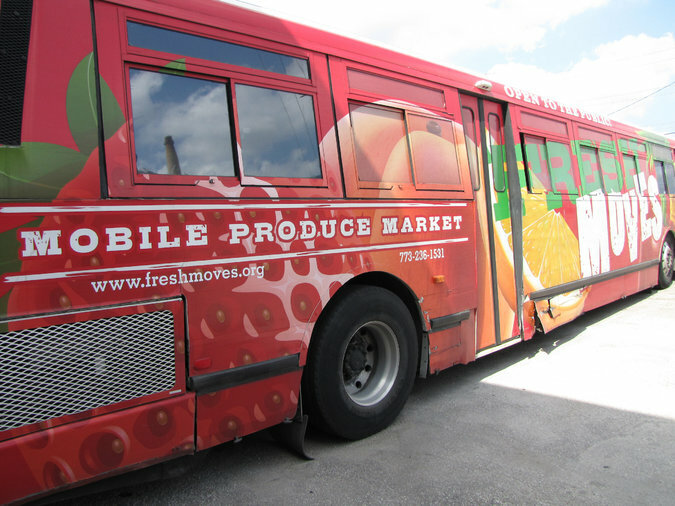 In Chicago, officials have doubled the number of city-run farmers’ markets and supported efforts like Fresh Moves, which converts disused city buses into brightly decorated mobile farm stands, transporting local organic produce to where people most need it. The project was the brainchild of young architects then nurtured by Growing Power, an agricultural nonprofit in the city, in collaboration with Hammersley Architecture and a graffiti artist. The number of Chicagoans living in food deserts has now dropped 40 percent. It was just reported this week that 2015 was the first year poverty declined and incomes rose across America since the economy collapsed in 2008. Even so, some 43 million Americans, including at least 14 million children, still live below the poverty line. Families are the fastest growing segment of the homeless population. Not everyone can wait for the government to fix things. That’s what this show is ultimately about. And about the forces that can thwart even the best intentions. There was also news on Monday that two prominent members of the Atlanta BeltLine Partnership board resigned. The BeltLine project is included in the exhibition. It was dreamed up more than a dozen years ago by a former urban planning student at Georgia Tech, Ryan Gravel. The idea: Turn four of the city’s abandoned rail beds into a green loop around downtown, producing parks and paths, art centers and housing; promoting bikes and walking over automobiles; linking rich and poor neighborhoods, black and white; generating billions of dollars in investments. The rails-to-trails concept took off. Mr. Gravel became a hero. The city and private developers showered the project with money. Housing prices skyrocketed along the route. But so did fears of displacement in low-income areas. Only one-tenth of the promised 5,600 new units of subsidized housing have been built. The BeltLine recently announced plans to raise money for more affordable housing, but the board members who resigned didn’t consider that enough. One of them is Mr. Gravel. So, as I said, some stories turn out to be more complicated. But nobody said progress was easy. “By the People” runs through Feb. 26 at the Cooper Hewitt, Smithsonian Design Museum, 2 East 91st Street, Manhattan; 212-849-2950; cooperhewitt.org.